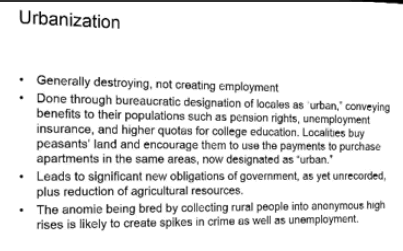 Malinvestments, pollution, and State-Owned-Entreprise (SOE) boondoggles (fraud is actually a better word) should all subtract from current GDP. Instead, fraud, pollution, and malinvestments have been buried and will remain buried until it's impossible to hide them. 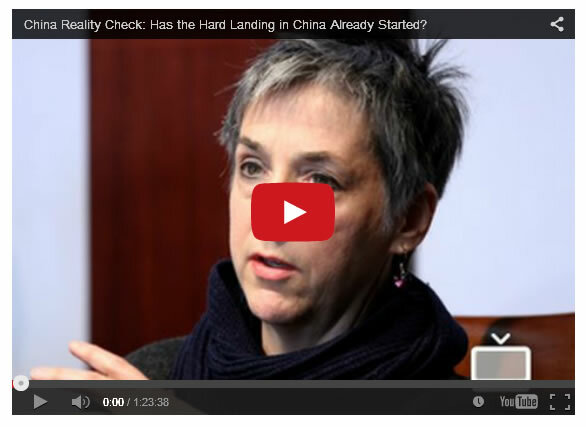 Please consider the following video presentation by Anne Stevenson-Yang. Comments between images are my notes, often not organized into complete sentences. The video is very lengthy, but there are a number of speakers. Yang was the first speaker. Her presentation was about 28 minutes, less if you skip the first four introductory minutes or so. The rest is time well spent. Is China turning into Japan? 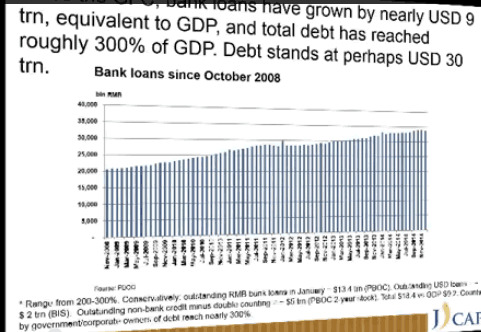 Debt is 200-300% of GDP counting Shadow Banks. If the average interest rate is 7% (banks 6% shadow banks 10%), economy would need to grow 21% in real terms to service debt. 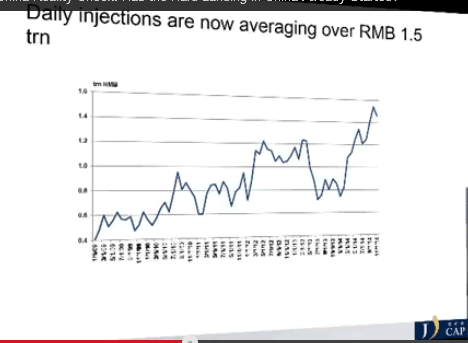 Since that cannot happen, banks cannot make loans without injections from PBOC. A fundamental problem is 100% of new credit goes to rollovers. Zombie economy effect - no credit demand - low demand. Steel down, electricity down, cement demand down Growth sub subzero this quarter. No way economy is growing. Massive overcapacity in petrochemicals, construction machinery, steel, cement, aluminum, SOEs. It will take years of growth to fill capacity. 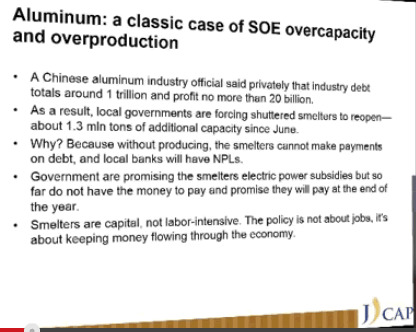 Aluminum official said privately debt Is $1 trillion, profit 20 billion. Local governments force mills to open because smelters cannot make payments, banks have NPLs. Smelters are capital, not labor intensive. Policy is not about jobs but about keeping money flowing. 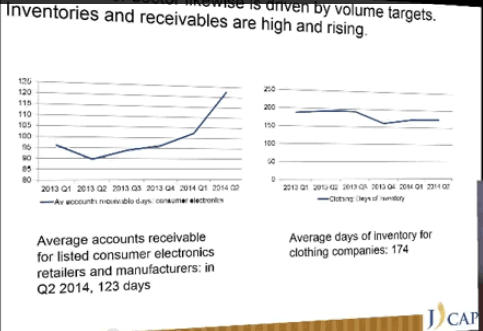 Consumer sector tracking close to 0% growth as well - average days of clothing inventory is 174 days, electronics 123 days. 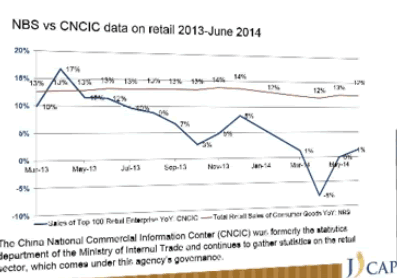 Consumer companies on China exchange Decline in gross revenue is 2% for the year, 6% third quarter. Local government officials hold nearby land with an incentive to get people to move in. Local people want schools hospitals. Property 20% of GDP and tracking negative (sales and pricing). Overcapacity is absolutely obscene - 70 million units in the pipeline. 50 million vacant units. At height of US bubble, US built 1.2 million homes. QE3 - No one has a good grip on who owns the debt. Allowing debts to go under without even understanding who understand it can create a chain of consequences that any government would be terrified to identify. Amount of capital required to keep rolling things over has reached a dangerous level. Massive daily injections to keep system running. China has over $3 trillion in reserves, but many of those reserves not so liquid. Is China's 1929 Moment Coming? Yang made her presentation on February 24. Since then, many others are questioning China's growth. For example, on March 5th the Washington Post asks Is China's 1929 Moment Coming? The numbers are historic. China's total debt has sprouted from 153 percent of gross domestic product in 2008 to 282 percent today. That, according to Goldman Sachs, makes China's borrowing binge bigger than 96 percent of all others on record. The problem is that, despite all this debt, growth is slowing and profits are falling, which makes it harder for companies to pay back what they owe. China has so much debt now that it doesn't get as much bang for the borrowed buck as before. That's because more of the money it's borrowing today is going to pay back the money it borrowed yesterday. How bad is it? Well, China's private sector is spending something like 13 percent of GDP on interest payments alone. China's banks are only allowed to pay people piddling interest rates, all so that exporters can borrow for less. That means, though, that people don't like to keep their money in banks, since they're really losing money on it once you account for inflation. Instead, they pour their money into property, snatching up empty apartments and leaving them like that, because they think those are a better store of value. Or they buy shadow bank products with names like "Golden Elephant No. 38" that promise 7.2 percent returns, but, it turns out, are only backed by an almost-abandoned housing project. In short, anytime people find anything that resembles a decent investment, it gets bid up until it's unmoored from any kind of economic reality. For the first time in a long time, money is leaving the country. The snag is that China's currency "wants" to weaken, but they're not willing to give up their dollar peg -- which forces them to shrink their money supply at the exact moment that their economy needs a bigger one. China, in other words, has plenty of problems even if its people don't become too scared to do anything with their money. But if they do, watch out. China, Japan, US or the World? The curious thing about the above Washington Post article is that with just minor changes, the article can equally apply to the US, Europe, or Japan. On March 11, the Financial Times noted China Data Point to Sharper Slowdown. At 282 per cent of GDP by the middle of last year, according to estimates from McKinsey, China's overall debt load is higher than that of the US or Germany. The economy expanded 7.4 per cent last year, the slowest pace in almost a quarter of a century and the government has lowered its growth target this year to "around 7 per cent" from last year's "around 7.5 per cent". The Financial Times wonders whether or not 7% growth will be reached. Yang does not believe China is growing at all, a downward assessment from her December 6, 2014 interview in Barron's. Please consider Why Beijing's Troubles Could Get a Lot Worse. Barron's: Investors seem far more concerned about Europe's sinking into economic despond than slowing growth in China. Are they whistling past the graveyard? Stevenson-Yang: I think so. China, for all its talk about economic reform, is in big trouble. The old model of relying on export growth and heavy investment to power the economy isn't working anymore.... The country is now submerged by the tsunami of bad debt that begets further unhealthy credit growth to service this debt. The recent lowering of benchmark deposit rates by the People's Bank of China won't accomplish much because it won't offer more income to households. Barron's: How bad can the situation be when the Chinese economy grew by 7.3% in the latest quarter? Stevenson-Yang: People are crazy if they believe any government statistics, which, of course, are largely fabricated. In China, the Heisenberg uncertainty principle of physics holds sway, whereby the mere observation of economic numbers changes their behavior. For a time we started to look at numbers like electric-power production and freight traffic to get a line on actual economic growth because no one believed the gross- domestic-product figures. It didn't take long for Beijing to figure this out and start doctoring those numbers, too. I put much stock in estimates by various economists, including some at the Conference Board, that actual Chinese GDP is probably a third lower than is officially reported. And as for the recent International Monetary Fund report calling China the world's biggest economy on a purchasing-power-parity basis, how silly was that? China is a cheap place to live if one is willing to eat rice, cabbage, and pork, but it's expensive as all get out once you factor in the cost of decent housing, a car, and health care. Barron's: Conventional wisdom holds that China has plenty of levers it can pull to stave off severe economic contraction and any debt crisis. Do you agree? Stevenson-Yang: Not really. Take, for example, the $3.9 trillion foreign-currency reserves that we discussed. Many people regard it as a giant piggy bank that can be tapped at will to rectify any financial problem. 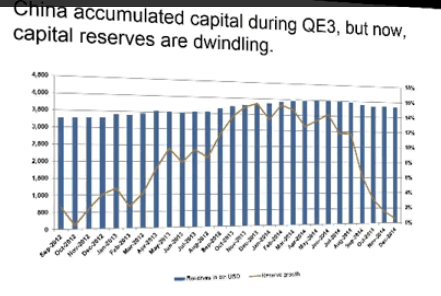 But the reserve is only good for defending the yuan and is a lot less liquid than many people realize. 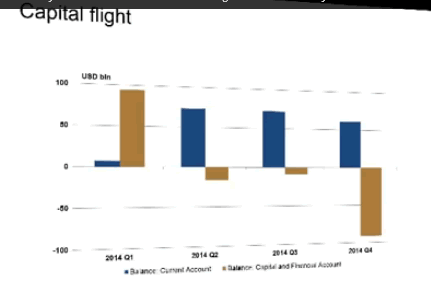 And as we pointed out, capital flight could dramatically diminish the size of the reserve. Interestingly, liquidity seems to be a growing problem in China. Chinese corporations have taken on $1.5 trillion in foreign debt in the past year or so, where previously they had none. A lot of it is short term. If defaults start to cascade through the economy, it will be more difficult for China to hide its debt problems now that foreign investors are involved. It's here that a credit crisis could start. China may be growing, but even 4% is not only a hard landing but a huge problem. Stretching to reach hugely unrealistic growth targets is precisely what has created zombie SOEs with debt that cannot be serviced, cities where no one lives, massive amounts of pollution, and a cornucopia of other debt problems. The spillover effects of a China slowdown on Australia, Canada, and Brazil are now widely recognized. Spillover effects of a China slowdown on the US and Europe have yet to manifest in a huge way. But they will. The US dollar is soaring and without a doubt that will hurt US exports. If China lowers the yuan to compete with Japan, an all out currency war loom at a time the Fed is presumably itching to hike. For a discussion on a potential currency crisis and a dollar shortage, please see Is There a US$ Shortage? Will it Sink the Global Economy? Again? The US economy is nowhere near as strong as it seems. With factory sales down 6 month, I am sticking with my US recession call made in January. I reiterated my US recession call on March 10 in Wholesale Trade: Sales Down, Inventories Up; GDP Estimate Revised Lower Again; Sticking With Recession Call. Finally, Europe is a complete basket case. Few understand that debt that cannot be paid back. Fewer still recognize that that Greece and Spain are not really to blame. For a very lengthy discussion of who is to blame for the crisis in Europe, what needs to be done (but won't), please see From ZIRP to NIRP: Virtues of Germany vs. the Vices of Greece; What About "Speece" and Gold? Add a US recession, European recession, and a China recession (or huge slowdown) together and there is only one conclusion: a global recession is at hand. Hardly anyone sees it coming.